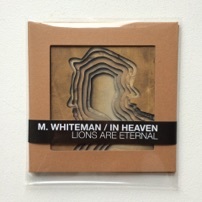 In Heaven was formed around the dueling talents of Monsieur Whiteman and Dominique Van Cappellen-Waldock and it captures the chill of stormy weather, interspersed with rare sunny spells. Imagine Nick Cave snogging Beth Gibbons to an Angelo Badalamenti soundtrack. If you can. Limited edition of 50 pressed cd, hand numbered in kraft gatefold digisleeve with selective UV printed inserts.